STEP1:- Notice of Calling Board Meeting for Board approval for conversion. The notice shall be given at least 7 days prior to the date of Board Meeting. STEP 2:- Hold Board Meeting and approve the conversion and authorize any director to file forms. STEP 3:-Check availability of Name of proposed LLP. 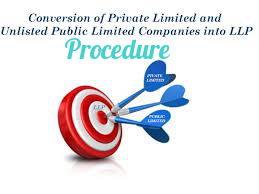 STEP 4:- File Form1LLP for application for reservation of name. 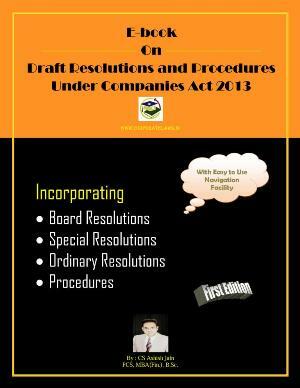 Copy of Board Resolution for conversion of company into LLP. If the proposed name is approved, it will be available for 3 months. STEP 5: Draft necessary documents (attachments) and get them signed by the designated partners or partners. STEP 6: File Form2LLP for submission of incorporation documents and subscriber’s statement. a.Copy of resolution on the letterhead of the body corporate, where the appointed partner is a body corporate, to become a partner in the proposed LLP and a copy of resolution/ authorization of such body corporate also on a letterhead mentioning the name and address of an individual nominated to act as nominee/designated partner on its behalf. iii.Rent Deed or Registry copy of address. c.Subscribers' sheet including consent to act as a designated partner/ partner. a.Statement of Shareholder of the company. b.Statement of accounts of the company duly certified as true and correct by the auditor. c.List of all the secured and unsecured creditors along with their consent. e.Copy of acknowledgement of latest income tax return. f.Challan of Last annual filing of the company. Form 18LLP and Form 2LLP shall be filed together. When these forms will be approved, then ROC shall issue a Certificate of Registration of conversion. STEP 8: File Form 14 (Company form download) for intimating the Registrar of firms/Registrar of Companies for conversion of company into LLP. Form 14 shall be filed within 15 days from the date of issue of certificate of Registration of conversion. STEP 9: File Form 3LLP for information with regard to LLP agreement. Form 3LLP shall be filed within 30 days from the date of issue of certificate of Registration of conversion. 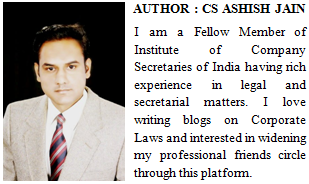 LLP agreement should be stamped as per the Stamp Act applicable to the state (Rs. 500/- in case of Rajasthan) and every page should be notarized.